Hairbusrt Review: Can Hairburst Give You Longer Hair? 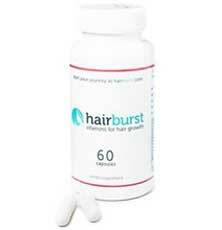 Hairburst is a natural health supplement for the hair that was originally known as HairVits. It claims to provide a safe combination of nutrients that has the ability to nourish the hair from within. The result of this is an overall improved hair health, elastic hair, faster growth and stronger hair that is free from breakage. How Should Hairburst be used? Hairbusrt comes in form of capsules. As per the manufacturer’s recommendation, take 2 capsules per day for a minimum of a month for maximum results. This is the dosage for all hair types and should not be increased for any other reason. In about two weeks the user should be able to experience a revitalized and more hydrated hair that is faster growing and better conditioned. The maximum results are seen in 3 months. The manufacturer claims that with Hairburst, your hair will grow by an inch a month and that it is suitable for all hair types. There are no side effects associated with this product. Can Hairburst Give You Healthier, Longer and Stronger Hair? Ingredients: from the ingredient list, it is clear that the products used have the potential to produce a healthier hair. Food: the food you eat plays an important role in the health of your hair. Those who eat healthier will experience the results of Hairburst faster than those who don’t. No pills can substitute a healthy diet. Have realistic expectations: do not expect to have ‘rapunzel-like’ hair just by using this hair supplement. An inch a month is realistic but do not expect your hair to reach your feet in a couple of years. Tame your expectations. Selenium – This helps with dandruff and thus prevents dry scalp. Zinc – helps to strengthen hair follicles. Calcium – prevents hair from shedding off. Hyaluronic Acid – this is a multi-tasking ingredient that helps to hydrate, support and nourish hair. Advanced B vitamin complex (Vitamin B1, B2, B3, B4, B5, B6 and B12) – these help to regulate hormones that impact the hair health as well as the immune system. Biotin – increases the production of keratin in the body which is hugely responsible for healthy hair. MSM – leads to longer hair by helping to lengthen the hair growing cycle. Collagen – an important protein that helps prevent dry brittle hair. BCAAS – these are fuel for the hair cells. Silica – revitalizes the hair and prevents hair loss. There are so many positive reviews on Hairburst with customers giving it an average of 4.7 out of 5 rating. It gives healthier, shinier and faster growing hair. It uses naturally sourced ingredients. Provides a clear list of its ingredients. It is free from any coloring and additives that may be harmful to the hair. There are complaints on poor customer service from the company. There appears to be difficulty in processing the refunds. The capsules are quite large and do not smell nice. It is an expensive venture. Shipping costs $10.98 US GBP to the USA. There is a money back guarantee offered though the time limit for this is not mentioned on the official Hairburst website. No phone number is provided for enquiring about and requesting the refund leaving one to rely on the company’s online platform (website). Though not meant to replace a healthy diet, Hairburst helps you get all the essential nutrients to the hair without the hassle of having to consume the nutrients through food. Let’s face it; you cannot get all the nutrients needed in a day regardless of how healthy a eater you are. Just taking the recommended 2 capsules a day is enough to set you on the track for a healthier, longer and stronger hair. For Hairburst to get a 4.7 out of 5 rating by its users, it must have impressed undoubtedly. Women stress about how their hair looks when they step out and are often willing to spend insane amounts of money just to get the perfect hair. Most of the times the products invested on end up being a huge disappointment. Hairburst capsules are no gamble and worth every penny thrown in their direction. The sure way to a healthier, stronger, longer hair is definitely the Hairburst way.